Jewelry is something that girls can never stop wearing and use for satisfying their fashion sense. But sometimes like me, you would probably feel that you cannot manage to buy or choose trendy and latest fashionable jewelry easily ,that’s when you need to make some DIY handmade jewellery for yourself. Here are unique and interesting 27 Best Ideas About Gorgeous DIY Jewelry ideas for making such pieces. Can you resist wearing this kind of pom pom necklace made with colorful pom pom and simple silver chains? Wear and enjoy them with different outfits. Try making some gorgeous combination of fabric and beads to make an excellent neck piece. Look at this elegant string and charm masterpiece. All these ideas are so tempting that you can’t resist trying them all. 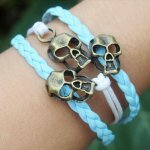 Make bracelets not only for girls but also for the young boys at home. The latest trends in terms of jewelry now days are the beads and ribbons combined together. Put a little effort in making this beautiful gold color necklace made with small golden rings. This is a pair of fish bone earrings that looks so cool and funky also suitable for your Halloween costume. So here is a shout out to all the gem lovers, make these DY gem rings which are giant and can decorate your pretty hands all alone so you are all set with these amazing finger jewels. These are paper made rose earrings; we have already told you how to make roses out of paper so just attach an earring hook to it for this. How can you ever forget your hair when it comes to a dress up? So try these clay hair pins and make your hair look great. Add some stone collection to your neck pieces, and for a unique look, wrap the stone with the chains as well. This is a boho necklace which gives a complete Spanish. What about this Elizabeth bracelet which is perfect for the formal occasions. Also add to your collection some metal wires such as copper and make rose rings with them. If you are in a mood to wear some stony jewelry, make some raw stone tops with the small raw stones and paint them in your favorite colors or these wire wrapped rings which are a combination of a wire and painted stones. Last but not the least, have a look at the tutorial of these super traditional silk thread jhumkas which are extremely eastern. All of these handmade pieces are so pretty that no one could ever believe you have made them with such easy methods and ideas.